After hours of testing products from leading brands such as Philips Norelco, Conair, Remington, and Panasonic, we’ve found the best stubble trimmer. The stubble beard is one of the most popular types of facial hair, and to keep it groomed without a complete shave, you’ll need a good stubble trimmer. With thick, heavy stubble being irresistible to women, taking the time to trim your beard and have it look perfect can make all the difference. And the best beard trimmer for stubble can ensure you get the closest cut without destroying your scruff. 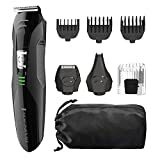 As you might have expected, high-end machines like the Conair Man Super Stubble and Philips Norelco Beard Trimmer 3500 offered a premium trim and experience. However, the Panasonic Milano was the most well-rounded adjustable shaver. Finally, if you’re looking for a budget stubble trimmer with maximum value and versatility, you’ll want to get the Remington PG6025 All-in-1 or Philips Norelco Multi-Groomer. Ultimately, using a men’s beard trimmer is vital to keeping your facial hair under control and clean. The best stubble beard trimmers allow you to style your hair with precision, leaving only the stubble you want, where you want it. Ultimately, this adjustable grooming tool is crucial to maintaining and shaping your short beard for a neat finish. So if you need that 5 o’clock shadow all the time for a stylish, rugged look, you’ll want to check out these top-rated trimmers for stubble. 2.3 Is A Trimmer’s Mobility or Portability Important To You? There is a variety of popular stubble trimmers available, but only a few offer a distinct edge over the rest. We’ve reviewed the top models for men, and these are the highest-quality products of the year with the highest customer satisfaction. The best part is they are all cheap and affordable for the everyday guy. So whether you really want to trim your beard, need a good trimmer for manscaping or are simply looking for a multi-purpose, all-in-one machine, one of these is bound to streamline your grooming process – and keep your facial hair looking classic and stylish. The Philips Norelco Multigroom is a model that covers all of your grooming needs. With 13 attachments, this effective stubble trimmer is hard to beat. For less than $20, you receive a full-size steel head, a head for precision cuts, and a nose and ear trimmer. The perks don’t stop there – this stubble shaver also includes 3 hair trimming guards, 3 beard trimming guards, and a stubble guard for added skin protection. 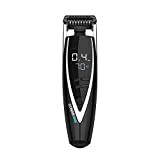 Furthermore, this top-notch trimmer has steel blades that sharpen as they shave, keeping the quality of your cut consistent for years after purchase. In addition, the Philips Norelco Multigroom unit comes with DualCut technology, a proprietary concept that incorporates 2x more self-sharpening blades for a close trim guys will appreciate. This scruff trimmer doesn’t even require the use of oil – simply remove the blades and guards, rinse, and reattach. All of these grooming tool extras come in a travel bag, allowing you to tote this tool wherever life takes you. Finally, the trimmer’s rechargeable Lithium-ion battery offers 60 minutes of run-time. And with the battery’s quick-charge feature, you’ll always be able to resume your shave within minutes of the unit dying. In the end, it’s no surprise that this trimmer has become a fan-favorite – Philips Norelco is known as one of the best trimmer brands on the market. This grooming tool’s value speaks for itself, and it can keep your stubble looking effortlessly stylish. For a higher-end model of the same series, check out this Philips Norelco groomer. The Remington PG6025 has a refreshingly-sleek design, and this grooming tool’s features will have your stubble looking sharper than ever. 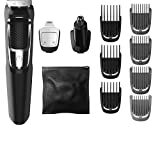 Remington’s timeless trimmer comes with 8 attachments to cater to all types of facial hair. A full-size trimmer, foil shaver, and a nose, ear, and detail trimmer allow you to take care of any unruly stubble. You can even style and tame your beard with the hair clipper guard – complete with 8 length settings. The 3 beard and stubble trimmer heads will perfect even the shortest of facial hair. The surgical steel blades are self-sharpening, with each use strengthening the quality of this stubble trimmer. Similarly, the feel and look of the blades show off their long-lasting durability. And it’s because of this quality-build that the unit and its attachments can be rinsed under water for easy cleaning. The most appealing aspect of this grooming tool is the lithium-powered battery, allowing you to trim and style cordlessly for up to 65 minutes. Plus, the unit has a power gauge to let you know how much battery is left, ensuring you always maintain a consistent, high-power trim. For a price less than $20, this trimmer for stubble is a grooming powerhouse. 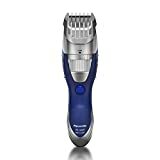 The Panasonic Milano All-in-One Trimmer is an award-winning model, and its defining features make it a cut above the rest. This stubble trimmer costs more than the rest, coming in at about $50, but this grooming tool is simply too effective, powerful and precise to ignore. This Panasonic trimmer has 45 degree stainless-steel sharp blades that can trim and shape any hair texture or length. With 19 precision settings (in 0.5 mm increments) for hair and beard trimming, guys can cut exactly the amount of facial hair they want for a perfect, clean stubble beard every time. Ultimately, this trimming tool gives your facial hair major definition in just a few moments. Lightweight, durable and with 50 minutes of continuous power, this cordless trimmer can even be brought in the shower for a quick trim anywhere. This also means you can use this machine to groom body hair or manscape below with ease. Use the cleaning brush or rinse under water to clean things up effortlessly. If you’re looking for a multi-purpose trimmer for your beard, hair and body, this model offers the total package. The Philips Norelco brand lands on this list twice – and this is no mistake. This trimmer brand reigns supreme, and the Bodygroom Series 7100 has a revolutionary design that allows you to shape your stubble with ease. This unit’s 3D pivoting head follows the shape of your face and body, providing a closer and more accurate shave. Rounded blades and heads help to prevent nicks and cuts of the skin, with five length settings to cater to all types of facial hair lengths and textures. This model is water-resistant and cordless, meaning you can accomplish a quick trim as you shower. However, the sturdiness and power of this trimmer also means you can use it to groom hair from all over your body. With 50 minutes of cordless use and a LED battery indicator showing charge, this groomer is a favorite among consumers. Philips Norelco certainly doesn’t let men down with this sophisticated model – and your stubble will be taken care of for years to come. The Conair For Men Super Stubble is part of another excellent brand with a long-standing history of making quality trimmers. While a bit pricey, this grooming machine specializes in trimming beards and is marketed as safe on sensitive skin. To achieve the perfect stubble and protect your skin, the unit is designed with a floating contouring head and electronic length controls. This means that guys can choose exactly how much stubble to leave with a few touches of a button. 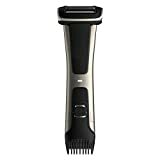 This Conair trimmer also comes stacked with electro-chemically formed blades that are extremely sharp, accurate and durable. The sharpness of the blades along with the flexibility head ensures a close cut for even your mustache, sideburns, and neck hairs. Another key feature is that the trimmer is 100% waterproof, allowing you to use it in the shower if you prefer a wet trim and clean it with a simple rinse. Lastly, the rapid charging feature allows the system to be fully-charged in 80 minutes for a total run-time of 70 minutes. The reliable lithim-ion battery powers full performance even at low charge levels so you never have to endure a bad trim. Obviously, Philips Norelco has a ton of high-performance beard and stubble trimmers on the market. This unique model has a few key features that set it apart from the other ones on our list. From the long-lasting battery to the self-sharpening titanium blades to the special length settings, you’ll be happy you chose this machine for years. For starters, this tool has 20 built-in length settings ranging from 0.5 mm to 10 mm. Complete with a locking system to guarantee an even trim, not having to travel with and switch attachments is a convenience many guys will appreciate. Then comes the titanium blades for an effective, hassle-free shave. The advantage of such sharp, well-designed blades is that this trimmer won’t tug on your facial hairs. Plus, they are low-maintenance and do not need oil. However, it is important to note that while you can rinse the shaving head under the sink, the unit and casing itself are not waterproof. Lastly, the Series 3500 comes with a battery that lasts up to 120 minutes (2 hours) on only an hour charge. Other models with similar performance require up to 10 hours of charging, making this machine exceptional. Before you purchase one of the top stubble trimmers on the market, you should take a few key grooming tips into consideration. When shopping for a new grooming tool, make sure you are looking at a trimmer that offers a head designed specifically for stubble. An electric shaver beard or hair clipper will not be able to trim your hairs to the right length effectively. An electric razor will shave your facial hair off, requiring you to grow your beard out again, while wide clippers won’t give you the control you want. Make sure the trimmer’s shortest setting is low enough to give you the closest cut you desire. This setting caters to hair below 1 mm (ideally the 0.5 mm trim) – and it can even shape and trim your 5 o’clock shadow. If it has a contouring head, trimming around the curves of your face will be a breeze and prevent cuts! Is A Trimmer’s Mobility or Portability Important To You? The most popular beard trimmers are cordless for increased convenience and easy maneuvering. However, some battery-operated models don’t have the power plugged machines have. Fortunately, we’ve only picked the most powerful units on the market so you really shouldn’t have a problem with this. Battery power and run-time can be limiting and extremely frustrating, especially if you are in the middle of a trim. When browsing for your new grooming tool, pay attention to the battery’s run-time and how long it takes to charge the trimmer to full power. Checking for a quick-charge feature may also save you a ton of time and frustration! Aiming to keep your stubble looking its best far into the new year? Investing in one of the best men’s stubble beard trimmers will keep you looking well-kept and trendy, and these models are the best in the business. A little masculine stubble beard will never go out of style, and these groomers will get the job done right every time.